My husband and I had a big picture hanging in our living room behind our sofa which we decided could go in the same position in our new much smaller place. Before the movers arrived, every picture we owned was meticulously wrapped in newspaper and Scotch taped by my husband. I discovered that a piece of tape had melded itself onto the glass of the big picture and did not want to come off. Needless to say I was already annoyed a half hour later when it finally came clean and the hanging process began. 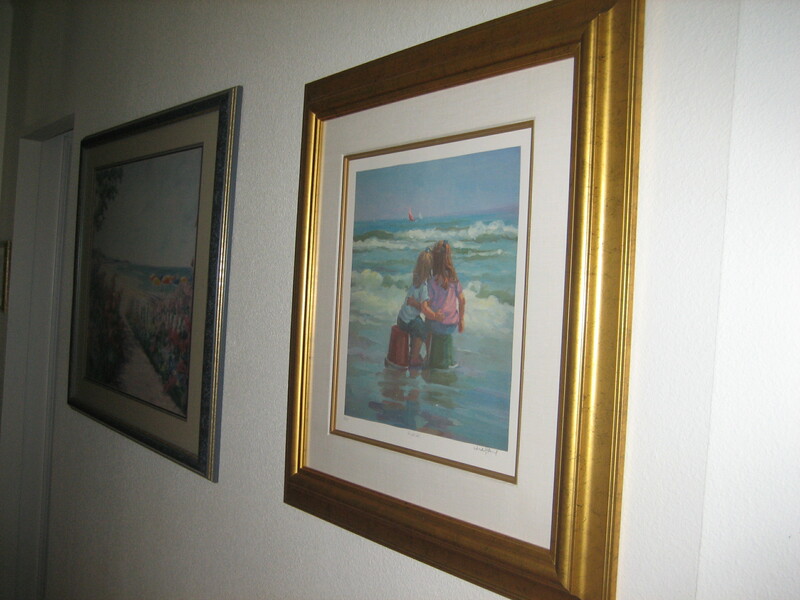 My method of picture hanging is to hold the picture up against the wall and judge by eye where to hang it. Preferably, there is someone else there to hold it while I step back and determine where exactly it should be. 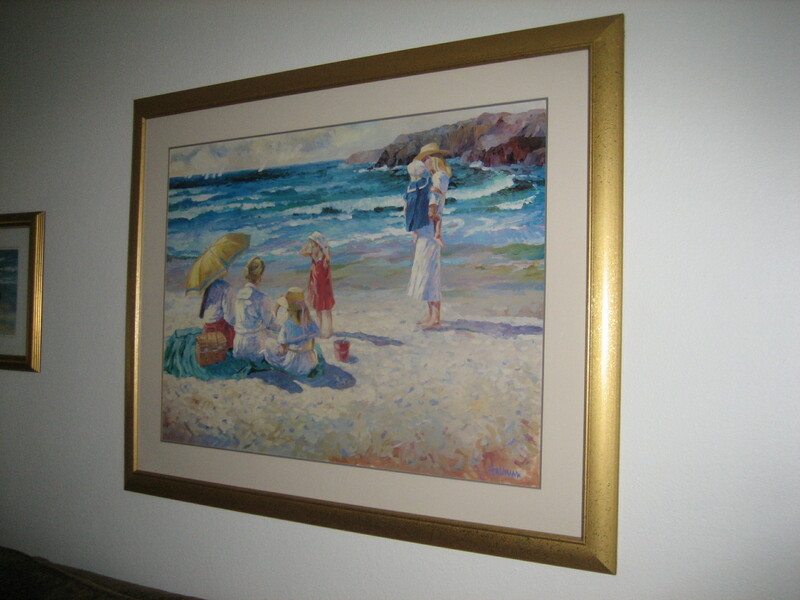 This particular picture had two loopholes on the back for the hooks and no wire, my least favorite kind to hang. I figured all I really needed to know was the distance between the middle of the two loopholes so I’d know where to put hooks in the wall. So I measured that to be a width of forty-nine and half inches. The holes were twelve inches from the top of the frame and two and a quarter inches from the edge. I have a level, a tape measure, a hammer and picture-hanging accessories. Easy to figure out where to put the hooks, right? I’ve now forgotten his reply to this, but he proceeded to use my number of forty-nine and a half for the width of the picture and did several calculations to determine the center point and marked it on the back. Only problem was, when measured in the direction to the other loophole, the number was different. I watched while he measured and calculated and scribbled numbers down. I never knew picture hanging was so complicated. After a bit he realized I hadn’t measured the entire width of the picture, only the distance from the hanging loops. Apparently, that changed everything. More calculations and muttering ensued until finally he determined that the picture was actually fifty-four inches wide which made the mid-point twenty-seven inches. “We don’t need that now,” he informed me. After we moved the sofa away from the wall, we got an idea of where to put the first hook. This was after much scrambling to find a step stool for one of us and a chair to stand on for the other. We realized we needed to measure the sofa to determine how high above it the picture would hang. He wasn’t happy with my pencil scribbles on the wall to mark the spot. I said, “No one’s going to see it, it will be covered by the frame. Besides, you’ll be painting this wall eventually, anyway.” This did not keep him from trying to erase the too-big mark I’d made. Me (working with my level): Okay, right there. Mark it. Me: You moved it, now it’s not level. Him: I can’t mark it while I’m holding it without moving it. One of us: Okay, let’s measure the distance across from the other hook. Set picture down. Take measurements. Level. Looks good. Nail hook. Hang picture. It’s crooked. Him: How can that be? Okay, we need to measure the distance from the floor. Me: I don’t think this floor is level. I place my level on the floor. Well, what do you know, it is. We measure the distance to the hook in the wall. Seventy-four and a half inches. Measure that distance on the other side. Mark it. Rehang hook. It’s more crooked. Remeasure. He determines it needs to be moved up a quarter of an inch but once I’m on the stepstool ready to put more holes in the wall he says…It needs to be moved down a quarter of an inch. Me: I thought you said it needed to be up a quarter of an inch. Even though I’m pretty sure this isn’t right, I remove the hook. Nail it into new location. Hang picture. Step back. Him: It’s even more off. Me. : That’s because it needed to go up a quarter of an inch, not down. Him getting close to having just about enough of my know-it-all-picture-hanging expertise: Okay, let’s measure it again. Me: If it’s crooked the next time, I’m leaving it. Hang the picture. Check it with the level. It’s just about perfect. Stand back. Bask in the glow. Him: I’m going to mow the grass. 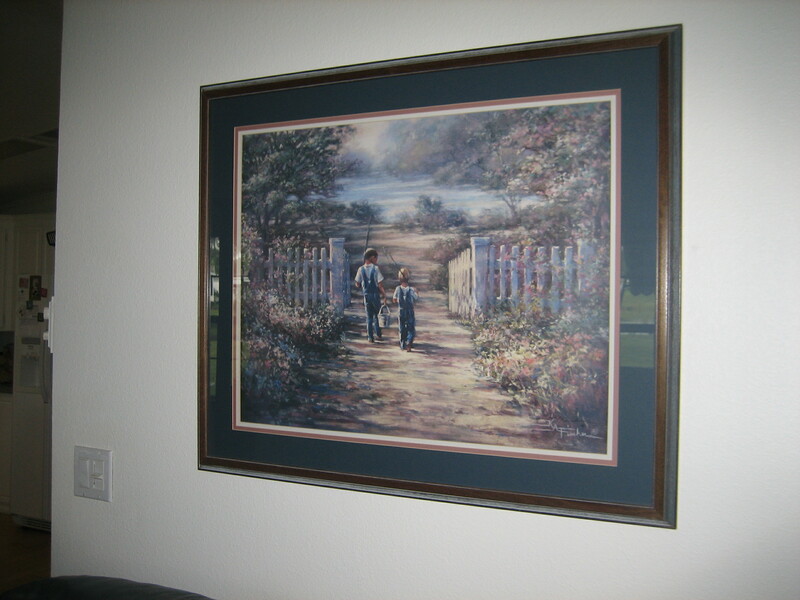 You can hang the rest of the pictures by yourself. He walked out steaming but there were moments during this process where it was so funny to me that I had tears in my eyes from holding back my laughter. I’d told him early on that this was a perfect example of how men do things so differently from women. But together we got it done. After he mowed the grass he helped me hang three more pictures. All of which had wires on the back. Mylatest book from Samhain Publishing is A FOREVER KIND OF GUY available in both digital and print versions. a forever kind of guy, art, barbara meyers, husbands, samhain publishing. Bookmark. I saw something on pinterest about putting a piece of tape on the picture between the two holes and then you put the tape on the wall.